However all this time the bear keeps on coming. Why is he chasing her? Or is it possible he’s not actually chasing her at all…? We love this quirky little adventure which shows you that sometimes the things you think you are scared of really aren’t that frightening at all. 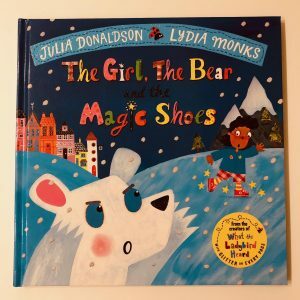 Lydia Monks’ illustrations are fantastic as always and we LOVE the cute little nods to her other collaborations with Julia Donaldson. Ivy immediately spotted a pair of Gruffalo boots (there are some ladybird ones too!) and was fascinated by the little books with familiar covers in the window of the bookshop at the beginning of the story.